6in x 6in x .025 metal with four 1/8in mounting holes. 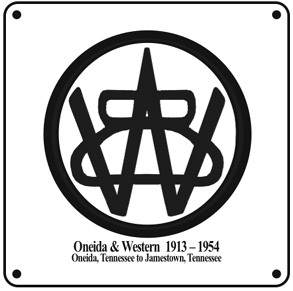 Square tin logo sign of the Oneida & Western Railroad that ran between Onieda, Tennessee and Jamestown, Tennessee. Sgt. Alvin York went to war and came home on the O&W through Jamestown or Jimtown as they called it in the movie. The O&W connected with the Southern Railway. Sgt Alvin C. York was World War I's most decorated soldier, including the Medal of Honor. He was played by Gary Cooper in the 1941 movie, Sgt York. Gary Cooper won his first Academy Award for the part. The movie is still one of the highest grossing movies of all time and a must see for every American. Sgt York took no personal money from the movie. My Dad, Michael George Fleming met both Alvin York and Gary Cooper. He spent a week with Sgt York at the Tennessee State Fair while he skipped school to work at the fair. Sgt York bought Dad a coke. He met Gary Cooper while serving in the NAVY during WWII in the Pacific on Destroyer USS Mahan, DD364..